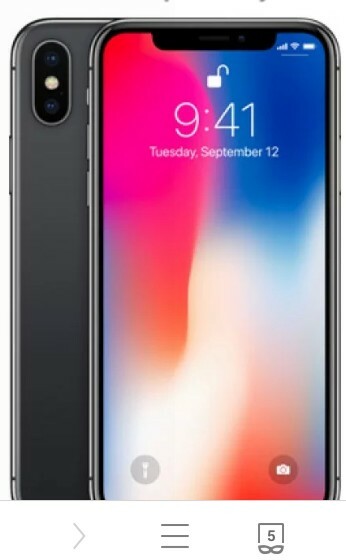 Unveiling the Generation X smartphone – 10 years after the launch of the phone that redefined what “smartphone” means, we have the iPhone X (pronounced ten). A decade ago, most smartphone owners used keypads but very quickly they wanted to use nothing but a touchscreen. Today Apple reached the inevitable conclusion – the sole hardware button that controlled iOS has been retired. It’s all screen on the front now and it marks more than one first for Apple. The iPhone X uses the company’s first AMOLED display on a phone (after a couple of years of experience with the Apple Watch). The screen panel is called Super Retina Display and measures 5.8" big with 458ppi pixel density (the sharpest iPhone yet, the resolution is 1,125 x 2,436px). Both HDR10 and Dolby Vision are supported and the panel offers a whopping million-to-one-contrast ratio (3D touch is still here). The bezels that are so familiar to Apple buyers have melted away, leading to an odd shoreline up north – the selfie camera, earpiece and several new sensors live there. They enable FaceID, the replacement of TouchID (there's no fingerprint reader on the iPhone X at all!). FaceID uses a flood illuminator (so it works in the dark) and a projector that paints 30,000 points on your face (sounds similar to the Kinect). The system is much more secure than TouchID, with a failure rate of 1,000,000 to 1 (fingerprints are good for 50,000:1). Apple warned that identical twins will likely be able to fool it, though. Also app support is easy - if it works with TouchID, it works with FaceID. This includes Apple Pay, naturally! Note that Apple used 3D masks to test the system and they didn't work - to unlock the phone, the you need to pay attention to the phone. Speaking of unlocking, you can also use tap to wake. Once the screen is on, you can swipe up to unlock. This swipe gesture is also used to bring the multitasking UI (swipe up and hold) and to go back to the home screen (swipe up to "throw" the app). Where does that leave the Control center? It's still here, it has just moved on top. The phone is powered by the Apple A11 chipset, which evolves the two-tier CPU design – it has two powerful cores and four energy-efficient ones. This detailed face scanning is used for the animojis too – the cute faces you use instead of punctuation now have a life of their own as they mimic your facial expressions. You can send a fixed expression or record a whole animated message with your voice. The selfie camera also gains Portrait mode thanks to the depth info provided by FaceID, including portrait lighting. The dual camera on the back of the iPhone X is the first mobile cam to shoot 4K 2160p video at 60fps. The highest possible 1080p frame rate also doubled, now reaching the impressive 240fps. The main camera boasts new, improved 12MP sensors. The telephoto also sits behind brighter aperture (f/2.4), while the regular camera stick to f/1.8. Both have optical image stabilization and the quad-LED flash now supports slow sync. The iPhone X borrows more than AMOLED from the Watch, this is also Apple’s first phone with wireless charging too. It uses the popular Qi standard, but enhances it with AirPower. A new charger made by Apple can charge the iPhone X, an Apple Watch and the AirPod case simultaneously. The best thing about this is that you can see the battery charge of each device on the iPhone screen. The AirPower will be available next year (and Apple is collaborating with Qi so that more devices will support these enhancements). PS. the X battery lasts 2 hours more than the iPhone 7 battery! Another battery-related novelty is fast-charging support. The iPhone X can gain 50% charge in 30 minutes if you have a suitable charger at hand. The Apple iPhone X will arrive later than the 8 models - pre-orders start October 27, sales begin November 3. There are two color options: Silver and Space Grey. The 64GB model will cost $999 and there's a 256GB option as well. In Europe, the prices start at £999 in the UK and €1,150 in Germany.